In what many see as a referendum on Trump's immigration policies, voters in several states rejected anti-immigrant platforms and ballot initiatives. 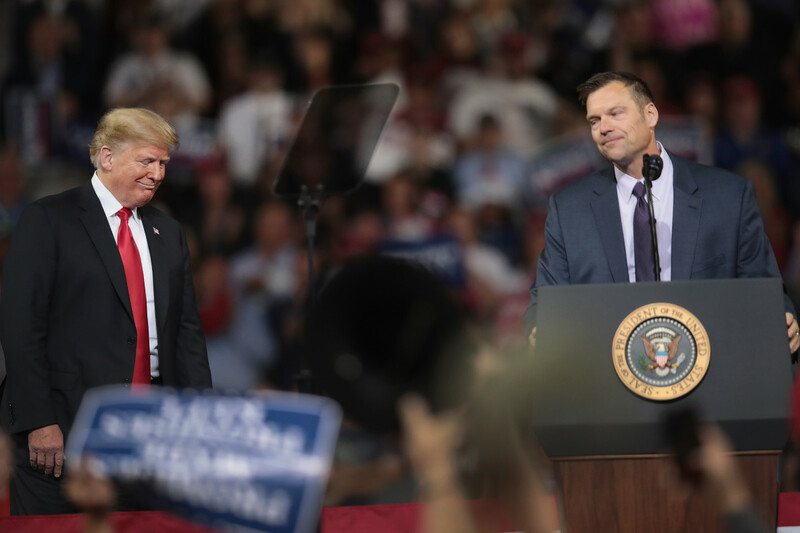 Republican candidate for governor of Kansas Kris Kobach, who lost his race on Tuesday, speaks at a rally with President Donald Trump at the Kansas Expocenter on October 6th, 2018, in Topeka, Kansas. 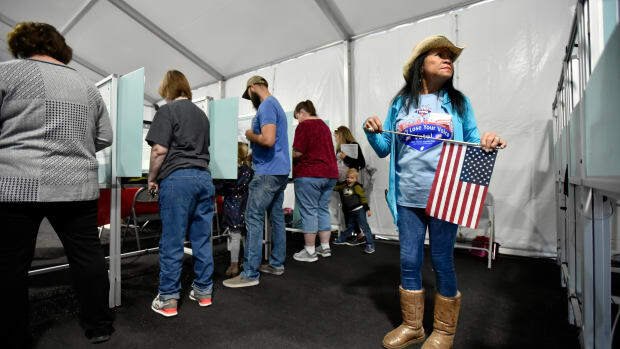 After President Donald Trump doubled down on his anti-immigrant messaging in the waning days of election season, voters across the country cast their ballots Tuesday in what pro-immigrant advocates are calling a rejection of Trump&apos;s divisive rhetoric. Across the country, many Republican candidates who sided with Trump on immigration lost their elections, and anti-immigrant ballot initiatives failed in multiple states. 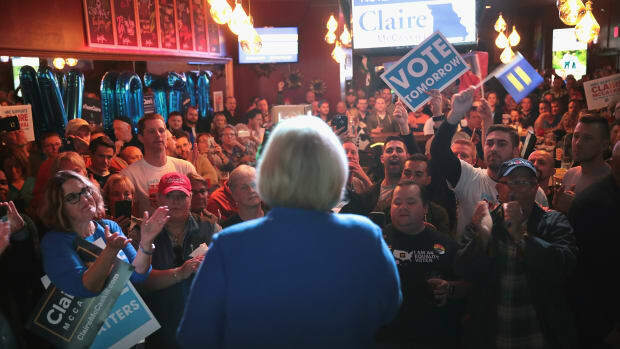 "Last night was proof that when voters are asked directly to vote on racial and discriminatory policies, they uphold the American values of liberty and justice for all," Lorella Praeli, American Civil Liberties Union deputy political director, said in a press release. 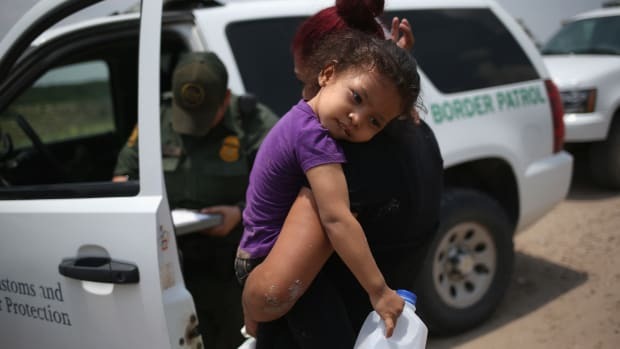 In a year marked by the Trump administration&apos;s short-lived decision to separate migrant families, polling revealed that many voters considered immigration a major issue in the election. In the weeks before Election Day, Trump&apos;s alarmed tweets about the Honduran "migrant caravan" culminated in his release of an anti-immigrant campaign advertisement that many called overtly racist. 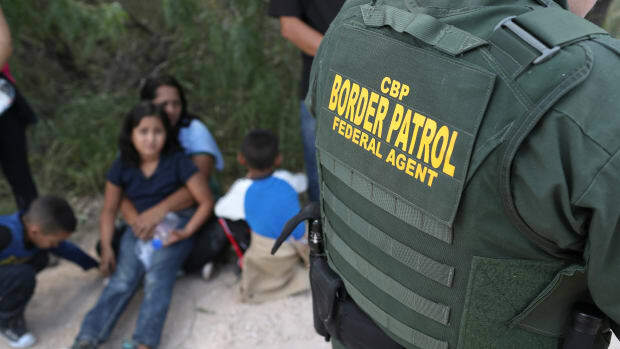 Though Trump hoped to leverage immigration as a wedge issue, several prominent Republicans candidates who invested in Trump-style rhetoric failed in their elections. Two anti-immigrant firebrands, Lou Barletta and Corey Stewart, both endorsed by Trump, lost their Senate bids in Pennsylvania and Virginia, respectively. Another Trump pick, Dean Heller, the incumbent Republican senator for Nevada, lost his seat to Jacky Rosen, a Democrat. Perhaps the most significant loss of the night for an anti-immigrant platform came in Kansas, where Republican Kris Kobach failed in his bid to become governor. Kobach, a close Trump ally, worked to ensure that the 2016 GOP platform included support for a border wall, and he voiced strong support for the Trump administration&apos;s travel ban (which opponents argued discriminatorily targeted Muslim immigrants). After waging a strongly anti-immigrant campaign, Kobach lost the governor&apos;s race decisively to Democrat Laura Kelly—an upset in a formerly deep-red state. Though pro-immigrant groups celebrated many of Tuesday&apos;s results, Janet Murguía, president of UnidosUS (the country&apos;s largest Latinx and immigrant advocacy organization), said her organization was disappointed with the results in Florida and Texas. In Florida, Democrat Andrew Gillum lost his bid for governor to Republican Ron DeSantis, an anti-immigrant hardliner. In Texas, Beto O&apos;Rourke lost his Senate race to incumbent Republican Senator Ted Cruz. How Did Latinxs Vote in the Mid-Terms? Turnout levels appear to have been high—and high numbers of Latinxs told their friends and families to vote too. 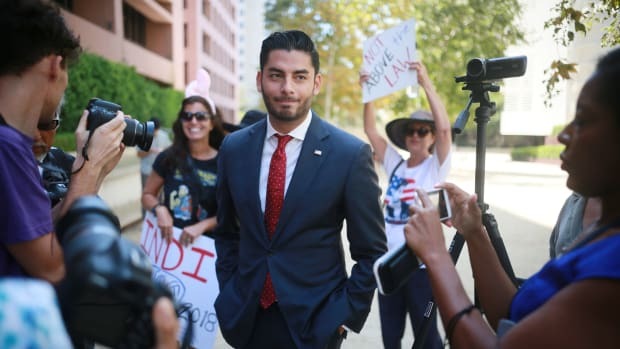 The outcome of the race between indicted incumbent Duncan Hunter, a Republican, and Democrat Ammar Campa-Najjar, could affect President Donald Trump's immigration policy, at least at California's border with Mexico. 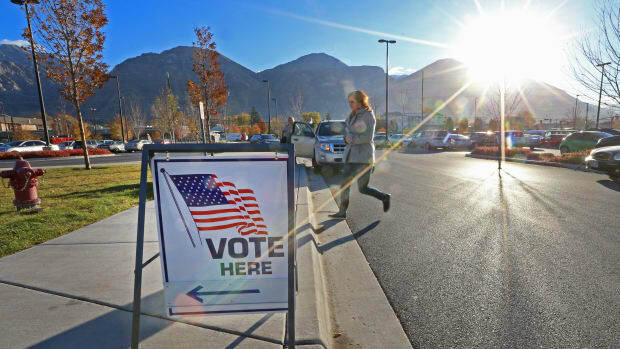 The campaign to make sense of the mid-term elections will begin almost the moment the polls close on Tuesday, and it will have a substantial effect on 2020. How Did Citizen-Led Redistricting Initiatives Fare in the Mid-Terms?